The past two years I’ve struggled on and off with my purpose. I think that we all go through those stages, don’t we? Call it an early mid-life crisis. Call it discontentment. Call it being “lost.” Whatever you want to title it, it isn’t a fun place to be. It is often lonely, frustrating, and depressing. To be so busy in life and yet feel like I’m not making an impact causes a sort of desperation to figure out where I’m going wrong. What should I be doing to feel fulfilled? Why don’t the things I’m doing satisfy? As a stay at home mom and wife I play a lot of roles. Small business owner (wannabe), blogger, chauffeur, cook, cleaning lady, boo-boo fixer, encourager, friend, daughter, ministry volunteer, designer, supporter, dog groomer, tutor….the list goes on and on. You know what I mean. You probably play similar roles and you most likely have other roles tacked on. This is what we call life. So the question becomes, how can we all be so busy, play so many roles, interact with many people, and yet feel like we are purposeless? These are all the questions that have jumped into my own mind over the last few years. They haven’t consumed me or caused me to sink into depression. They haven’t made me question my faith or my decision to quit working outside the home. They are just “there”. Looming and lingering and rearing their ugly heads every now and then. But these feelings surface often enough to cause an occasional discontentment, and so they are something I need to talk about with others and ensure that I don’t try to battle alone. And I’m guessing you’ve felt the same way at some point in life. Imagine a wall of gears. Picture a large gold cog in the center of the wall. This is God. Now imagine a smaller cog next to it. This is you. By nature, the smaller cog is incapable of moving unless it’s locked into the larger God cog. Separation by mere centimeters is all it takes to render the smaller cog immoveable, purposeless, and incapable of spinning. Now imagine that there are dozens of smaller cogs surrounding you. These are people in your sphere of influence. Family, friends, co-workers, even strangers. Even if you are locked into all of them, without being locked into the large God cog you still won’t spin. You cannot make the rest of the cogs spin without the power of the largest cog. Now lock yourself into the God cog. Read His Word, pray with determination, make His ways your ways, His thoughts your thoughts, serve Him, love Him, and when His cog spins then so will you. And in turn, the rest of the cogs you are locked into will spin. I was taken aback by her analogy because it so beautifully captures an image of how important it is to be locked into God. Can’t you picture it? This huge wall with a magnificently orchestrated arrangement of cogs, all next to one another, with the power source at its center, just waiting to be locked into each other so that His power can impact first one small cog and then every other one in return. I don’t know about you but it made me think about life differently. Looking back I can easily see that those times when I was discontent and felt purposeless were the times when I wasn’t locked into God. My cog may have been spinning but it was being blown by the wind, not by the power of God which gives purpose. And since I was spinning recklessly it negatively impacted all the other cogs I was locked into. So this year, as I referenced in my 2017 Year in Review post, I’m focusing on Proverbs 3:5-6. 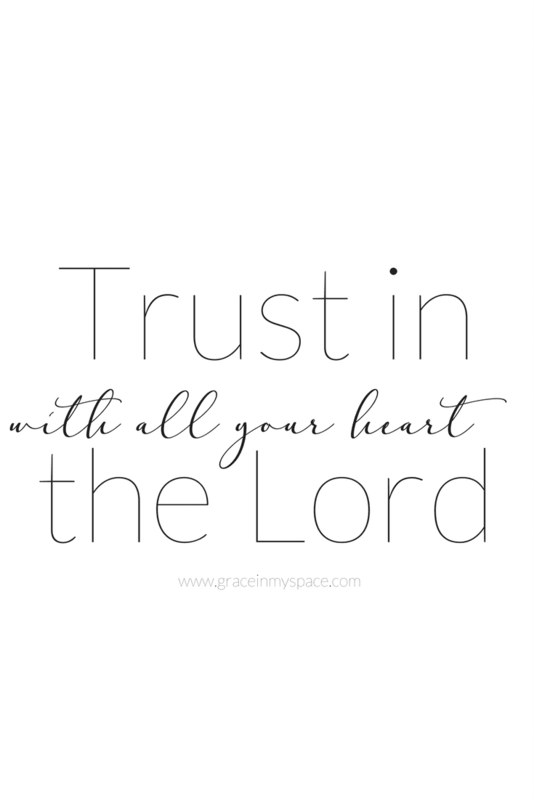 Trust God. Don’t lean on your own understanding. Acknowledge Him. And guess what? He will spin your cog in the power of the Holy Spirit and with purpose. As a reminder, all my subscribers have access to my free printable library where you can download my Monday Musings of Grace printables and other fun DIY templates.